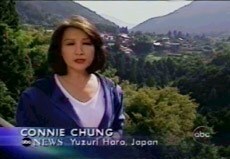 Connie Chung’s ABC News segment reported that the normal diseases associated with old age are rare in this town: cancer, alzheimer’s and even wrinkles are uncommon. The locals live well into their 90’s and often over 100 years old. Despite “unhealthy” habits such as drinking sake and smoking cigarettes, they don’t suffer from the normal diseases associated with getting older. This anti-aging mystery continues to baffle scientists. How do the residents of Yuzurihara defy the “laws” of aging? Researchers compared the lifestyle and diet of the town’s residents to those of the average Japanese. They noticed that the locals ate much less rice than typical Japanese. Instead, they were eating a local root vegetable called “Satoimo” (also called “sticky potato” even though it isn’t really a potato). 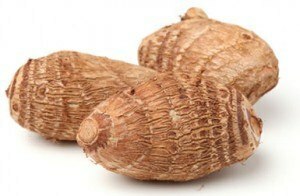 Could this root be their anti-aging secret? Connie Chung interviewed Dr Toyosuki Kimori who has spent sixty years investigating the anti-aging mystery of Yuzurihara. He believes the explanation to their youthfulness and longevity lies in an anti-aging compound known as Hyaluronic Acid (“H.A.”) which happens to be abundant in the Satoimo root vegetable which they eat so much of. Hyaluronic Acid keeps our skin moisturized, plump, smooth and elastic. It supports new collagen growth in the skin and joints, which gives them a more youthful appearance. Scientists now believe that collagen-stimulating Hyaluronic Acid is the secret to the long life and the wrinkle-free skin of Yuruzihara’s residents. Collagen is the main structure of most of your body–the structure that makes your skin plump, holds your skeleton together, etc. The main signs of aging are due to the collagen in your body breaking down. So H.A.’s ability to slow this process down makes it one of the most powerful tools in your anti-aging arsenal. Collagen is the building block of healthy skin, bones, joints and more. It’s the structure and elastic netting of your body. H.A. and collagen have a very important relationship in your body. H.A. stimulates new collagen production and also protects existing collagen. Taking Hyaluronic Acid is a great way to improve the health of the collagen in your body. But when you combine it with collagen peptides, the results are even more impressive. Collagen peptides are proven to enter the bloodstream within 90 minutes of ingestion and to collect in the tissues of the skin, bones, and joints from the inside out. This is proof that collagen peptides actually re-build the collagen that has broken down over the years. Various studies show that collagen peptides reduce wrinkles an average of 30% over a six week period, improve bone density and signs of osteoporosis, and even restore the tissue in your joints. Besides taking supplements for Hyaluronic Acid or collagen peptides, you can also find many collagen boosters at your local grocery store. They’ve been hiding in plain site all this time. And just like the Satoimo potato, you can incorporate these foods in your diet and see great results in your skin, joints and bone health. I created a free e-book with 10 ways you can boost your collagen at home. You can click here to download your free copy now. Did you know there are actually over a dozen foods you can eat that will boost your body’s production of collagen and Hyaluronic Acid? I compiled these collagen-boosting hacks in an ebook you can download for free. Check it out and leave some feedback as a comment here or on my Facebook page. If you need any help or advice, I’m here for you so don’t hesitate to ask any questions.